Today I had the biggest surprise! While working hard at my desk, I was summon to go to the President's office to photograph an event for Alan Rosenberg. So, I hurried down the hall and when I arrived, to my surprise, it was not a photo op at all but it was just a ploy to get me down to Alan's office so that Anne Marie Johnson can give me a autographed picture of Michael Dorn who plays a well known role as Lt. Commander Worf in Star Trek TNG. To most of you, this is just a regular picture, but to me this is priceless because Michael Dorn doesn't signed Star Trek memorabilia anymore. 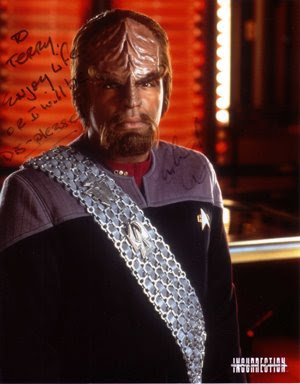 In fact, last month when Lan and I went to the Star Trek Tour at the Queen Mary, some of the cast of TNG artwork has everyone's autograph except for Michael Dorn's. This is a very rare Star Trek TNG keepsake. It's all due to Anne Marie Johnson. She's a good friend of Michael Dorn. When she invited him to the SAG 75th Anniversary celebration, I was somewhat starstruck when I saw him. I'm usually pretty cool around celebrities. Anne Marie found out about my admiration of him, and worked her way in for the past 5 months to get an autographed photo for me. She is such a sweetheart.